Williams Lake, B.C. 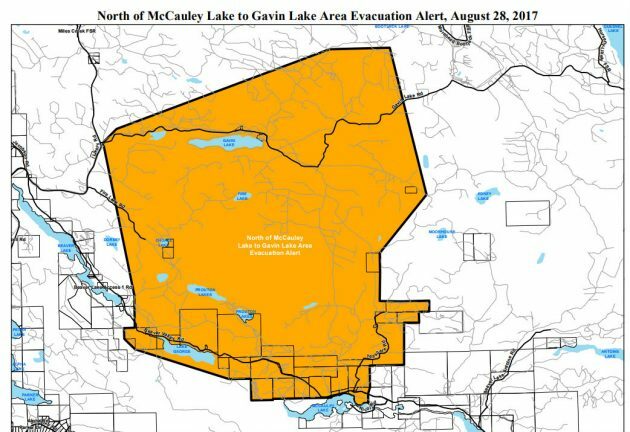 – The Cariboo Regional District has downgraded the evacuation order to an alert for the area North of McCauley Lake to Gavin Lake, about an hour’s drive northeast of Williams Lake. It means 49 residents can now return home though the CRD reminds those people that air quality in the area remains poor. Those with respiratory issues, small children and the elderly are asked to consider this before they go home. Residents are also strongly encouraged to register for the Cariboo Chilcotin Emergency Notification System to receive a text, call or email regarding evacuation orders and alerts.